Owing to our top notch infrastructure facility, we are offering a wide collection of Cotton Kitchen Towel to our customers. Besides, offered collection of products is fabricating using high-grade raw material procured from the reputed vendors of the market and progressive techniques in line with the set industry norms. We are offering these products in various colors, according to the precise requirements of our clients. 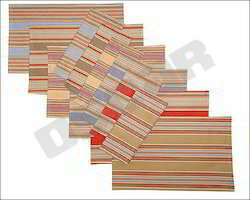 Description : Bright colors in intriguing stripes make lively kitchen mates. Absorbent towels sizzle in different color stories. 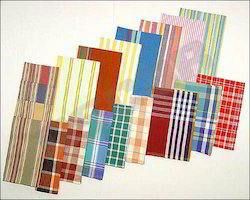 Our striped & plain towel collection shall enliven your kitchen with vibrant color. They are yarn-dyed of substantial gram cotton. Machine wash. 100% Cotton. Choose from all-over multistripe or white with multistripe dobby. 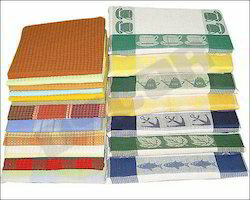 Our organization is backed by a team of experienced professionals who gives a continuous assistance to offer an exclusive range of Decorative Kitchen Towel to our esteemed clients. These products are manufactured using optimum quality fabric and modern technology in tune with the set industry quality standards. In addition to this, we are offering these products in various sizes and colors in order to meet various requirements of our huge client base. 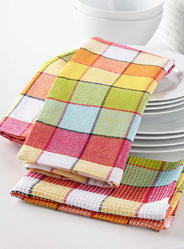 Description : Decorative Kitchen Towels come in a variety of cheerful designs to brighten your kitchen. Each waffle weave towel is extremely absorbent, so it's a handy addition to the kitchen. Towels measure 18" W x 28" L. 100% cotton. Machine wash. 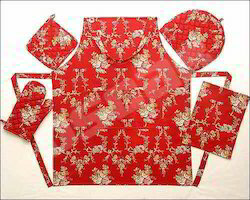 Description : This lovely printed Home Apron will help keep your clothes protected from food splashes and spills while in the kitchen. The cotton apron features an adjustable neck strap, long waist ties and a front double pocket. 100% cotton having adjustable neck strap, long waist ties & front pocket. Quilted pot holder and mitt having hanging loops. Machine wash. Description : These bright striped kitchen linen employ a fresh color palette to update a Spanish tradition that was popular in the 19th century American West. A complex arrangement of yarns is required to achieve the rich effect of the heavy weave. Yarn dyed fabric mats pair with solid napkins.100% cotton - machine wash Available in five color ways. 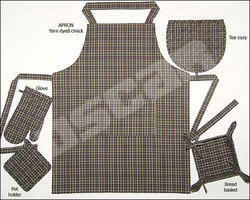 Description : This yarn dyed plain cotton Apron make the perfect accompaniment when preparing any meal. Its construction features Western look faithfully rendered in a beautiful check. 100% cotton. Dimensions: 27 in x 35 in Machine wash tumble dry. 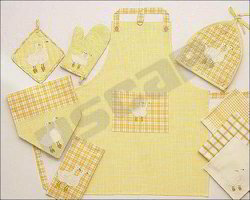 We are offering a large collection of Beaded Kitchen Linen in the market. The products we are offering as per the modern clients demand and available in various creative patterns, and eye-catching designs. These products add an extra elegance & look to your dinner table. Apart from this, our clients can avail these products at the budget friendly price from us within committed period of time. Description : Beaded table ware items. Coaster - napkin ring - place mat all glass beaded in different shades and looks shall add an extra elegance & look to your dinner table.